That afternoon, Ship Captain Kitsu Keiji reported to Admiral Jama's quarters in the Floral Estates, crisply announcing his name and rank to the gate attendant before inquiring whether the Admiral was available to receive his report. He was relatively quickly admitted and led to a room where Jama, accompanied by Suru, was studying documents. "The great questions of the day will not be decided by courtly discussions or pious prayers to the Heavens, but by blood and iron." Keiji bowed deeply as he was brought into the room. "Honored Admiral," he said in a respectful tone. "With your permission, this one would report on the status and progress made by Kunshu Maru." "Greetings, Captain. Proceed." Jama nodded briefly. "As the Imperial Admiral commanded, Kunshu Maru and her crew have cultivated friendly relations with the inhabitants of Kameyama Jima," Keiji related. "I have established friendly contacts with the Governor of the West Port and with certain prominent merchants. The artisans and monks that Kunshu Maru transported have been relocated onto the island to establish the Fortunist shrine, as was decreed." "A certain amount of commerce has been conducted in order to win the trust of local persons. 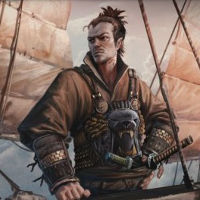 This, along with the efforts of our Chief Engineer, has resulted in Kunshu Maru acquiring some of the large gunpowder weapons that are favored by local warships," he continued. "Although I had my doubts about their effectiveness at first, the power of these weapons is impressive and I believe they will be a valuable addition to the Admiral's fleet." "These are rather welcome developments, Kitsu-san. Proceed along this course and you'll be commended. I am particularly pleased with your advances in gunnery. The cannons may come useful soon enough. Anything else, Kitsu-san?" "Kunshu Maru's guns stand ready for whatever duties the Admiral requires," Keiji said, beaming at Jama's praise. "We have also continued charting the northern waters, as you commanded. A full report was filed earlier, describing the island with statues of big heads and ancient ruins, but if the Admiral has any further questions on the matter, this one is here to serve." "The report will suffice. I am more interested in the location of the Thranish hideout in those waters." He paused. "I am increasingly displeased with how the Teppodoka are being commanded. The next misstep of their accidental officer and I am going to let you take them over, Kitsu-san." 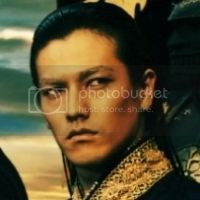 "It would not be the first time the Commander of Teppo proved unequal to the task at hand," Keiji ventured to opine. "If it pleases the Admiral, this one is at your service for any duty that is required." He bowed again. Jama nodded. "Await short notice."